Schneider Electric's dual 600/1,000-volt solar farm—the first such facility in the U.S.— was built as a test lab to develop components for sustainablesolar farms and help the company optimize its inverter design and PV solar applications. Aside from copper wire and the approximately 3,500 solar panels and racking, the solar components on the Smyrna project are all made by Schneider Electric. The project is one of the three largest solar farms in Tennessee, producing enough energy to cover, on average, 25 percent of the energy consumed at the Schneider Electric facility. Research and development facilities are often considered a necessary expense. But what about an R&D facility that not only conducts testing, but showcases new products and generates revenue? This is the case with Schneider Electric's 1-megawatt solar farm located on six acres in Smyrna, Tennessee. It's a dual voltage—600DC and 1,000DC—solar farm, the first of its kind in the United States, and it was built as a test lab to develop components for sustainable solar farms and help Schneider Electric optimize its inverter design and PV solar applications. If that wasn't enough, it is one of the three largest solar farms in the state, producing enough energy to cover, on average, 25 percent of the energy consumed at the facility. It's surprising there aren't more dual voltage solar farms out there. 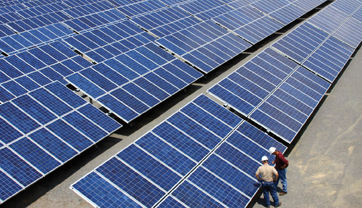 Global companies, like Schneider Electric, provide solar components to companies that run on either 600 or 1,000-volt systems. "In the U.S., we produce power with 600 volt systems. In Europe, many of those systems are 1,000-volt systems with fewer connections and everything that goes with a higher voltage system," says facility manager Edwin Willhite. "This solar field is configurable between 600 and 1,000 volts, so that it can be operated as a working lab. We can demonstrate our own products, like inverters, DC switchboard, and DC switches, to a U.S. market that's not as familiar with the 1,000 volt market." Aside from copper wire and the approximately 3,500 Suntech solar panels and racking, the solar components are all made by Schneider Electric. For the company to switch the solar field configuration from 600 to 1,000 volts and back again is relatively easy. "The panels remain the same, it's the configuration box out in the field that changes," says Willhite. "It's essentially a matter of disconnecting or changing four bolts, turning a plate around, and putting those bolts back in." During the design and construction, creating a safe process for future users was of utmost importance. "We did a lot of work to ensure we could isolate and provide the right amount of safety for our operators and technicians when they make those kinds of changes," adds Willhite. When the solar farm went live, it began simultaneously running and testing the 1,000-volt inverter. The solar farm will run at 1,000 volts for a period of time, and when the operators are satisfied with tests results, they will move on to something else. Creating energy is almost a byproduct. Since Schneider Electric makes a wide range of products for a global market—residential to commercial—there won't be a shortage of products to test. 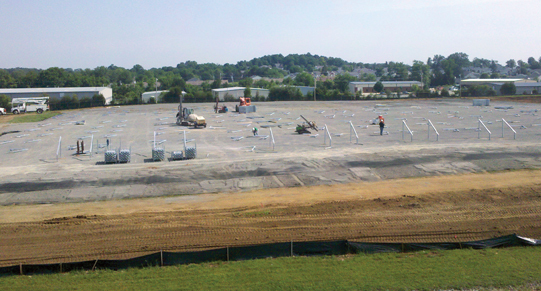 The price tag for the solar field came in at $6.25 million. Willhite says a percentage of the amount went toward the cost to build a traditional solar field, and part went into the R&D component. Testing facilities are expensive because of added technology. For example, the dual voltage solar field required three different grounding grids. "It has a positive, a negative, and a no ground or floating ground. So we have three times the amount of copper for grounding than we would normally have because we have different kinds of grounding systems. We also have additional switches—part of our safety design," explains Willhite. "Making the field configurable for either voltage or grounding, and being able to accept the power in whatever configuration we may choose to use is complex. Credit goes to our own Schneider services group that did the design." August of 2010. After that we had about three months of pre-work before we began construction," says Willhite. "It was an incredible team effort, not just with TVA but with many different divisions and parts of Schneider Electric." Hundreds of individuals were involved during construction, and about 50 people were out in the field for months. It also required a lot of patience and understanding from the employees at the Smyrna facility when roads shut down during construction, among other things. "When we needed help, they came and pitched in to help," says Willhite. "They were a big part of that team as well." Schneider Electric got to put its facility to the test immediately. The field went online on July 25th, followed by days of triple-digit temperatures. "Our solar field was operating at full capacity, and we were putting a megawatt back on the grid, at the same time our local utility was asking other customers to lower their load," says Willhite. "It was satisfying to use this testing facility to help generate renewable energy and help with grid issues," he adds. "I could look at the dashboard and see we were really making a difference." The power generated at the solar plant is equivalent to 25 percent of the power needs at Schneider Electric's Smyrna facility. Currently though, they are selling the power to the local utility and buying it back. Although the solar field has run smoothly from the start, like any other first-of-its-kind project, it came with its own unique challenges. Bill Brown, the Schneider Electric engineer for the project, had his work cut out for him from the start. "Bill was not only designing and getting specifications so that we could use Schneider products, but some of those Schneider products had not been developed yet," says Willhite. "To make it work, we were developing new products, getting them on time and getting them ready to work by dates we'd scheduled way in advance of their development. It was a real engineering challenge." One of the new products that had to be incorporated were the combiner boxes, which collect energy from the panels. "The combiner boxes move up to progressively bigger boxes so that you consolidate the power coming from those boxes to go to the inverter," explains Willhite. "We also had a brand new DC switchboard to help manage the power into the inverter from those boxes. The configurable box where we can change from 600 to 1,000 volts was also new." 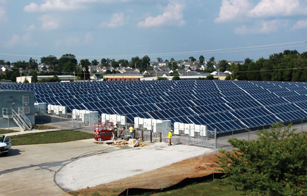 The Schneider Electric facility is a dual voltage—600DC and 1,000DC—solar farm, the first of its kind in the United States. It was built as a test lab to develop components for sustainable solar farms and help the company optimize its inverter design and PV solar applications. With all these challenges the ribbon-cutting day was more than just a formality, it was the satisfaction of a job well done. It was a 100-degree day, and attendees could see the field working at full capacity. "You could see first-hand that with our ever-growing energy demand, we were part of the solution," says Willhite. When the facility isn't doing research and development, it runs just like any other solar farm. It requires little maintenance and Schneider Electric can monitor activity remotely. "I can be in North Carolina, call it up, and look at how the facility is performing and operating from my desktop," says Willhite. By selling the energy produced to the local utility, the one-megawatt farm will pay for itself in approximately eight to nine years. "However, when we consider what we're getting in terms of product development, design, testing, and marketing, our payback should be much shorter than eight or nine years," says Willhite. Many renewable energy companies have to educate local communities and convince them to install their facilities. That wasn't the case with Schneider Electric. First, the solar farm was built within an industrial park, so there weren't many of the building issues new projects run into. "The solar field is adjacent to a local greenway," says Wilhite. "There is a walking trail that covers roughly two sides of the solar field, and our local municipality has given us permission to put a sign out on the greenway that explains what we're doing, what it means to the community, and how it contributes to the greenway." Second, the project has generated both excitement and interest. Actually, the better term is overwhelming interest. Schneider Electric receives an average of one request per day to tour the facility. Requests are coming in from the Boy Scouts to the local college, and from customers to suppliers. "We even had a local college ask if they could bring out classes every quarter," says Willhite. "Right now, we are trying to set up a protocol so that we can accommodate them. We want everybody to come see us, and we want everybody to go home and talk about solar power." Besides being a large, cutting edge solar facility, the Schneider Electric tour has a bonus feature. "We have also developed an electric car charging station for cars like the Nissan Leaf. And we have installed four Schneider Electric EVlink charging stations onsite, so that's generated some curiosity too." Even though it was a challenge to develop something that had never been done before, Willhite said it's been a lot of fun. "Energy efficiency is in our DNA. We help companies and consumers' organizations manage their energy better. We believe that energy efficiency is the best step towards a more secure energy future."